As Neil Armstrong is quoted as saying when he first walked on the moon, “That’s one small step for man, one giant leap for mankind”. It was one step that forever changed the world and dramatically impacted so many. Have you ever thought about this in regards to your own life? How hard it was to take the first step, but the many blessings that came from doing so? Consider the story of Glenn. Glenn stepped into Center of Hope several years ago. He had a lot of time on his hands and wanted to help. The initial conversation was pleasant and Glenn tried to be upbeat, but one could see he was completely broken and deeply troubled. Glenn was 80+ years old and had just lost the love of his life . . . his wife. Glenn wondered “What’s next?”, “How can I live without her?” He apologized as he cried and said how losing his wife was almost more than he could take. We listened. We talked. And, although there was nothing that could be said or done to take his pain away, God still had a plan for Glenn. Glenn started volunteering and came in every day. A few months ago, Glenn turned 90. His years were starting to slow him down and he was having a hard time working to his own high standard. Although Glenn would not admit it, he knew his service time was complete. 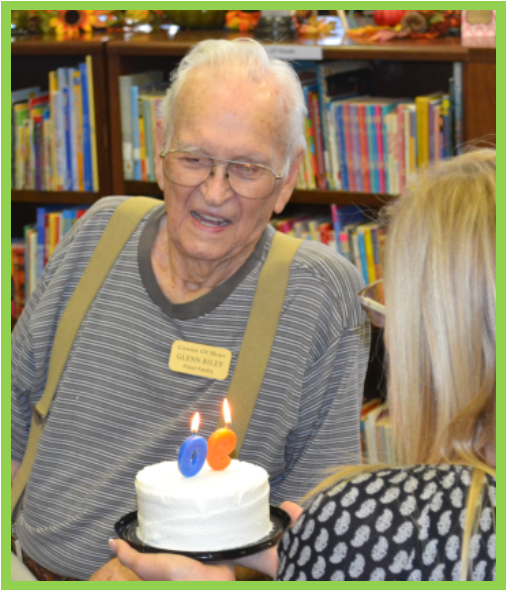 Center of Hope held a special party to celebrate Glenn’s birthday and to thank him for all he had done. Glenn was so appreciative, thanking the Center, his family, and God for his good fortune. Glenn never thought of himself first, and probably didn’t realize it at the time, but by taking his first step into the Center, it changed not only his life, but the lives of so many more. All it takes is ONE SMALL STEP. Volunteers are critically important to Center of Hope. We invite you to join us the first Thursday of each month at 2:30 pm for our Volunteer Orientation to learn more about the many ways you can get involved and help others. We would love to have you!